Lyme Regis on the Jurassic Coast in Dorset is a place of incredible geology and history, with ancient dinosaur fossils and sea creatures discovered on its beaches. Angharad Moran takes a tour with local experts and explores the beaches to see what else can be found. As our small group of eager, first-time fossil hunters looked out across the beach at Lyme Regis, geologist Paddy Howe, our guide for the day, was busy explaining that Britain would have been much closer to the equator during the Jurassic period. The beaches at Lyme Regis form part of the Jurassic Coast, which stretches along the Dorset and East Devon shores. It is ascribed as a UNESCO World Heritage Site for its important geology and the fossil deposits found within the layers of rock along the coastal cliffs. Here, remnants of over 185 million years of Earth’s history lay hidden, just waiting to be discovered. “This is one of the best places in the world to find fossils and people come from as far away as Australia,” says Paddy. “We do find a few things you wouldn’t expect. We’ve had 10 land-living dinosaurs found here since 1858. A dinosaur called scelidosaurus, which was an armoured herbivore up to 14-feet long, isn’t found anywhere else in the world, it only comes from this one small area. I’ve been very lucky; I’ve managed to find parts of three of the 10 known specimens, including once during one of my fossil walks about four years ago. 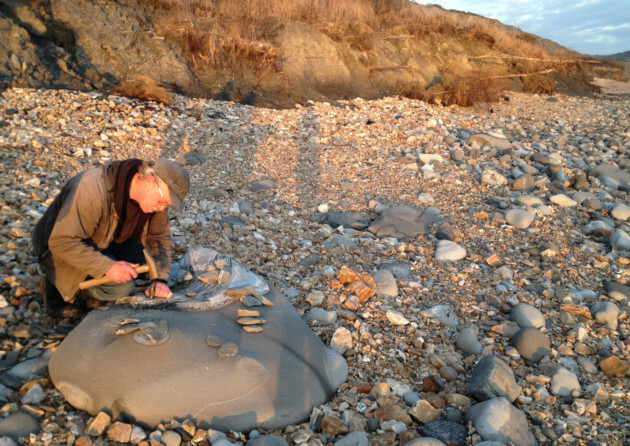 The only essential equipment you need to find fossils in Lyme Regis is a keen pair of eyes as the soft stone that makes up the coastal cliffs is constantly crumbling, scattering its bounty of fossils onto the beaches below. Paddy went on to produce other examples of what we might find on our walk, including belemnites, a form of ancient squid; ammonites preserved in limestone and calcite crystal, as well as coprolite, the polite, scientific name for fossilised dinosaur dung, complete with fish scales and the bones of other reptiles. After running through what to look out for, it took Paddy a matter of minutes to find all manner of ammonites, belemnites and other fossil fragments. The other fossil enthusiasts that had joined us on the hunt were also soon spotting the signature spiral shapes of ammonites amongst the pebbles and rocks that conspire to camouflage them. I, however, remained determined yet unsuccessful as Paddy passed me all sorts of fossils, his trained eye picking out minute fragments mixed in among the beach detritus. Every time I thought I might have found something, it would turn out to be nothing more exciting than good old-fashioned stone. There was once a time when people thought the skeletons of strange, unrecognisable creatures must be the remains of those that didn’t make it aboard Noah’s Ark. Today, we know much more about the world that predates mankind and the host of creatures that inhabited it until they finally became extinct. Whether you’re particularly into palaeontology or not, it’s hard not to get excited at the prospect of finding a small piece of this ancient world on the Dorset coast. Guided fossil hunting walks can be arranged through Lyme Regis Museum, where you can also learn more about Mary Anning and the fossils discovered in the area.